I love masala chai and often make it at home. It's rare to find a pre-made or cafe created chai that doesn't disappoint, so I always have low expectations. 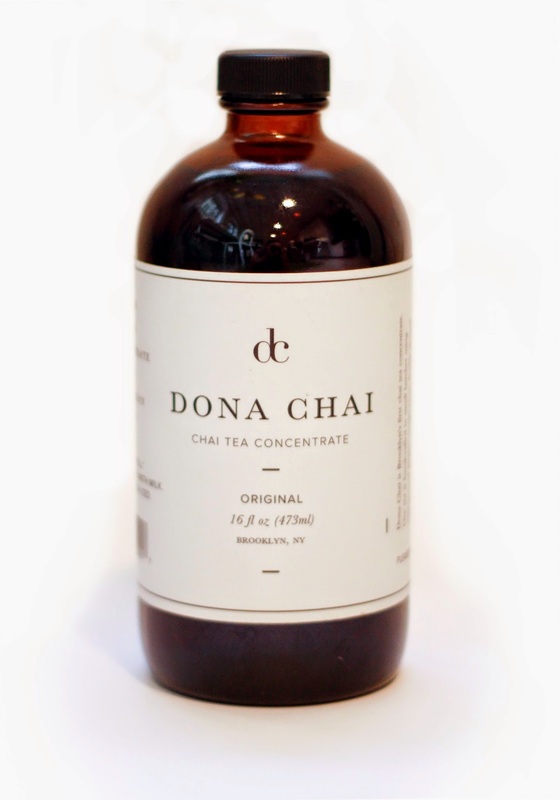 I recently had the opportunity to try Dona Chai, a new bottled chai concentrate starting to pop up in NYC area markets and cafes. The invigorating aroma straight from the bottle smells like a homemade masala chai. After mixing with milk, the flavors are still fresh, zingy, and well balanced. This is definitely the best chai concentrate I've had, and I was eager to learn more.The founders Amy and Peter Rothstein were more than happy to answer a few questions for me, so read on to learn more about their product. Why did you start Dona Chai? Several months after moving to New York City, I realized that there wasn’t a local company making a chai concentrate. Especially, in coffee shops, where everything is locally driven, I saw a need for this product. I wanted to offer a local and better option for chai lattes. Unfortunately, my ingredients do not grow locally. I choose the next best thing: a local supplier. The owner of Dual Special Store - an Indian grocery in East Village - provides me with all of my ingredients from his Brooklyn warehouse. Actually, fun news! I’m working on donating my compost to the Brooklyn Grange. How did you decide on the flavors to add to your recipe? I started with a list of around ten spices. I played around with brewing techniques and flavor combinations before landing on my recipe. I ultimately decided that I wanted to create a chai that was refined in flavor - not too complicated, and instead, perfectly balanced. What I came up with was my version of a masala chai: black tea, cold pressed ginger, cinnamon, green cardamom, vanilla bean, cloves, and black pepper. Why did you decide on a concentrate, and not a powdered product or loose tea blend? When baristas make chai with loose leaf blends, the tea only steeps for a few minutes before getting to the customer. Instead, Dona Chai is brewed for nearly an hour. This yields a tea that is powerful in flavor. Coffee shops and markets throughout NYC. Check out my site, donachai.com, or follow Dona Chai on instagram, twitter, or facebook. All of our locations are listed on our website. Why is the company called Dona Chai? When I chose this name, I didn’t think that I’d have to explain the history! Most people ask if my name’s Donna. So, I wanted to call my company something abstract, but with meaning. Dona is taken from the name Donna. My mom had a childhood doll who she named Donna. Do you have any personal tea rituals? Are there any family tea rituals that you had growing up? My mom makes a pot of English breakfast tea every morning. But, growing up, I remember hating tea, for the bitterness. Now, I like tea. My favorite is a sweet herbal tea during winter. A huge thank you to Amy and Peter for the interview! For part 2 of this spotlight, stay tuned for a formal review of their chai (spoiler: it's very tasty) later this week.